Have you ever lost a data stick and wished you had backed it up. These simple to use files offer you the opportunity to backup your data stick every time you place it into a pc. 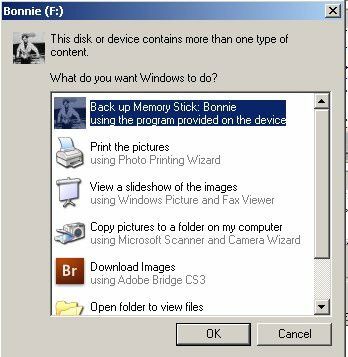 The standard Microsoft Windows Auto Play opens and offers you a list of actions, one of which will be to backup your memory stick. You decide if you want to back up the memory stick or not. A full copy is made of your memory stick and stored on the pc. If you were to lose the memory stick you simply obtain a new memory stick of the same size, or larger, and retrieve all your files from the last pc the memory stick was backed up on. It could not be simpler. System not tested for windows 7. 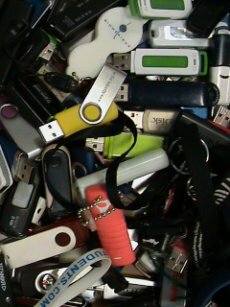 The system of adding an icon and naming the device applies to any memory stick device, including phones, cameras, etc. This allows you to add an image may be of yourself onto the device or include your name. Every time the device is attached to a computer your icon image and device name will appear as the storage device. It has been argued that accessing files on a lost memory stick to return it to its owner is a violation of security and illegal under the data protection act. The lost data stick labeled with a name could limit the illegal act to checking there was data on the stick and the name appeared with out directly accessing other data files. The accessed file would exist for the purpose of owner identification. This is how it works and looks. If you want to backup the memory stick click on the OK button, the back up will occur, or choice another option. The first time all files are copied over, from then on only new files or amended files and folders are copied. There is a little reminder about helping Africa. To close the window "Press the Any Key". If Auto Play has been suspended on your machine, an alternative to the Auto Play menu is to open My Documents, point at the memory stick, view the folders and then double click (open) the sbu batch file this will cause the back up to occur. This method can be used to back up your memory stick at anytime, remember you still have to have permission to write to the C drive of your backing up machine. Free Donations - Make a donation, yes a free donation every time you shop with Amazon! Click here for more information about Free Donations.